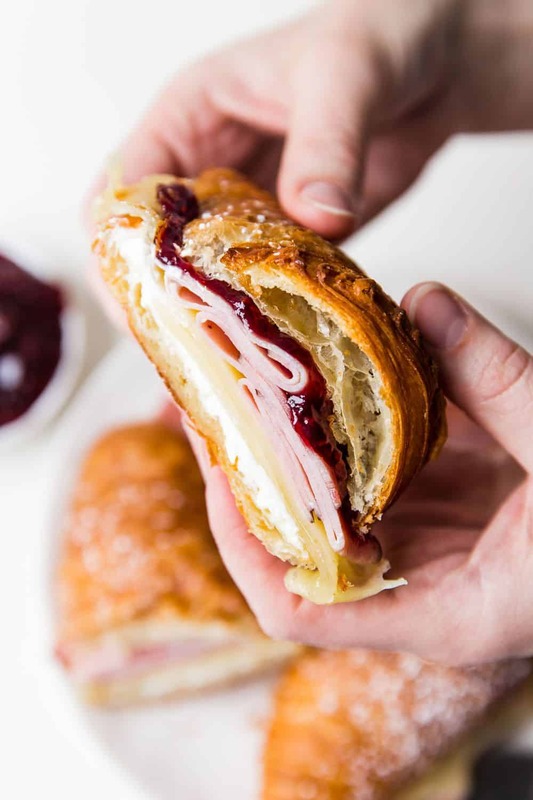 Monte Cristo Croissant Sandwich is a flaky croissant with melted Swiss cheese, decadent ham dipped in a raspberry jelly that will melt in your mouth with each bite! You will be in heaven with this sweet and savory sandwich! Breakfast, lunch and dinner is served with this Monte Cristo Sandwich! You can’t go wrong with a warm, buttery crust that is melted together to create a classic sandwich in your own oven. We had our first Monte Cristo Sandwich at Disneyworld and our family is hooked! The flavors melt together and warm you with a comfort meal that everyone loves. These sandwiches come together easily and can be baked in the oven using Reynolds Wrap. I love how easy it is to use. I am always finding new ways to use Reynold’s Wrap aluminum foil and it gives that crisp clean cut for any size that you need! I love the thickness that Reynolds Wrap has and that it is oven safe. 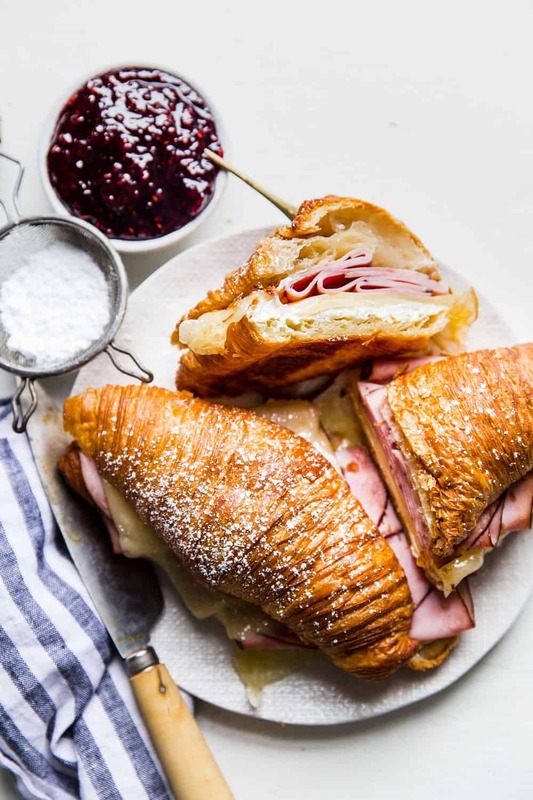 Wrapping these Monte Cristo Sandwiches helps keep in the warmth, melts the cheese and leaves the sandwich nice and flaky for the perfect combination! I love how it can keep the sandwiches warm until you are ready to unwrap them. Once you unwrap your warm Monte Cristo Sandwich your family will be thanking you! With Easter coming soon, this is a great way to have leftover sandwiches with the ham. These make for a quick meal or snack during the day. Easy to hold using the Reynolds Wrap too! 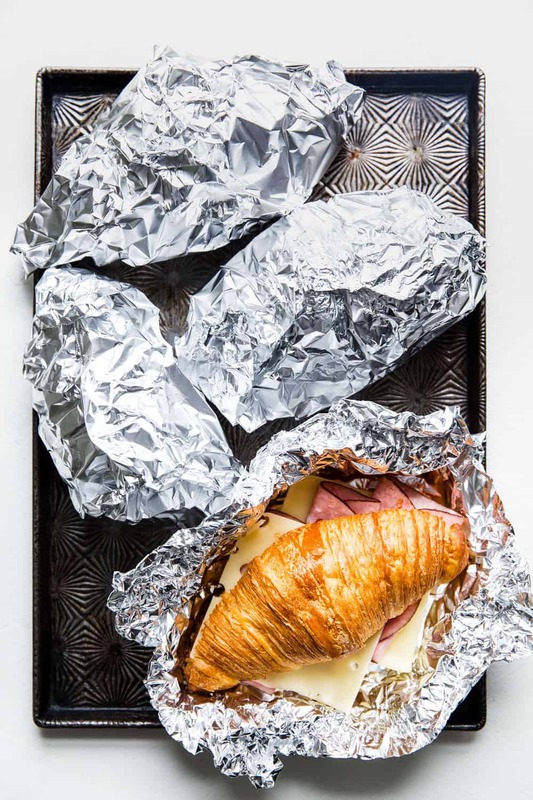 You can leave the leftover sandwiches in the fridge and pop them in the oven wrapped in the foil to warm them up. 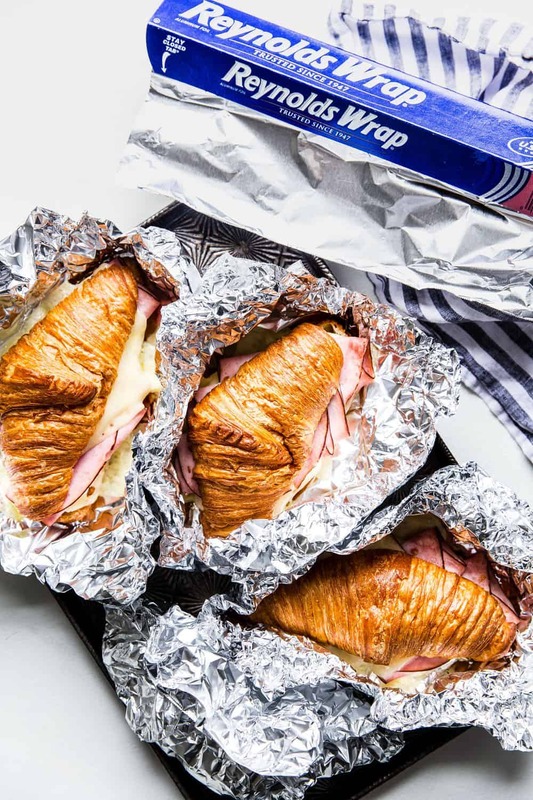 I love how you can store them in the foil and easily warm them back up in the oven! How Do You Make a Monte Cristo Sandwich? Slice each croissant in half. Spread the inside of the bottom half of the croissant with 1 oz cream cheese. Top with one slice of swiss cheese, then one fourth of the ham and top with another slice of swiss cheese. Repeat for all 4 sandwiches. 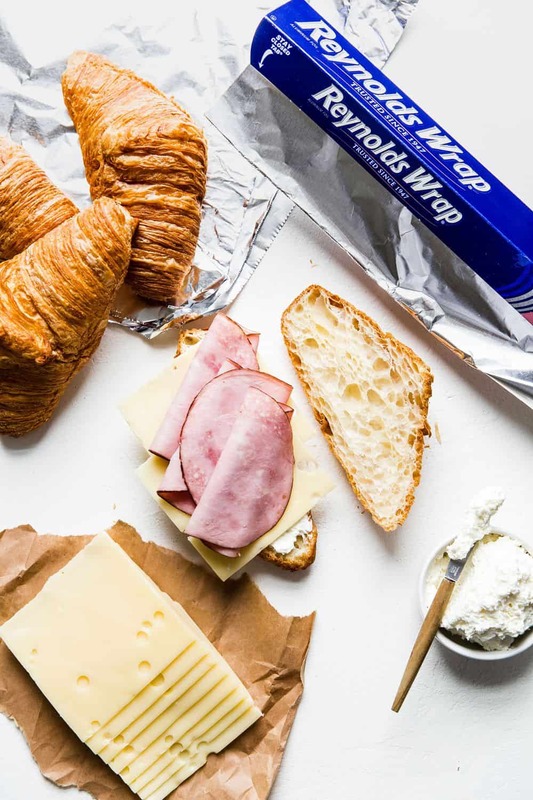 Wrap each sandwich in Reynolds Wrap Aluminum foil and place on a baking sheet. Bake for 10 minutes until the cheese is melted and the ham is heated through. Serve dusted with powdered sugar and dipped in raspberry jam. What is a Monte Cristo? How Many Calories are in a Monte Cristo? 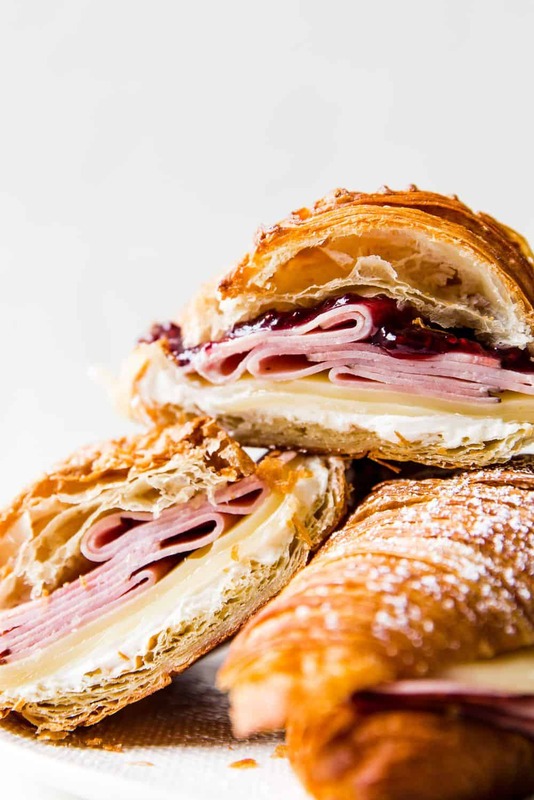 Calories may vary according to restaurant or home cooking and the amount of ingredients used to make the sandwich, a typical Monte Cristo contains more than 1,000 calories. 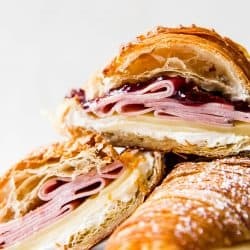 SkinnyKitchen.com states an average Monte Cristo has 1,122 calories. What Do You Serve With a Monte Cristo Sandwich? Can You Make Monte Cristo Sandwiches Ahead of Time? Yes! Assemble all the ingredients together. You can store them in a ziplock, air tight container or pre-wrap them in the Reynolds Wrap to store in the refrigerator up to 2 days. When ready to bake follow the remaining instructions. Enjoy! Can You Substitute the Meat and/or Cheese? Absolutely! That is a great things about this sandwich! Instead of ham or swiss, you can mix and match any meat and cheese of your choice. Then bake according to directions. Things to Know About Reynolds Wrap! This post was sponsored by Reynolds Wrap. All opinions expressed are my own and I love supporting brands that I use in the kitchen for myself! Next PostNext How to Make Peanut Butter at Home (So Easy)!